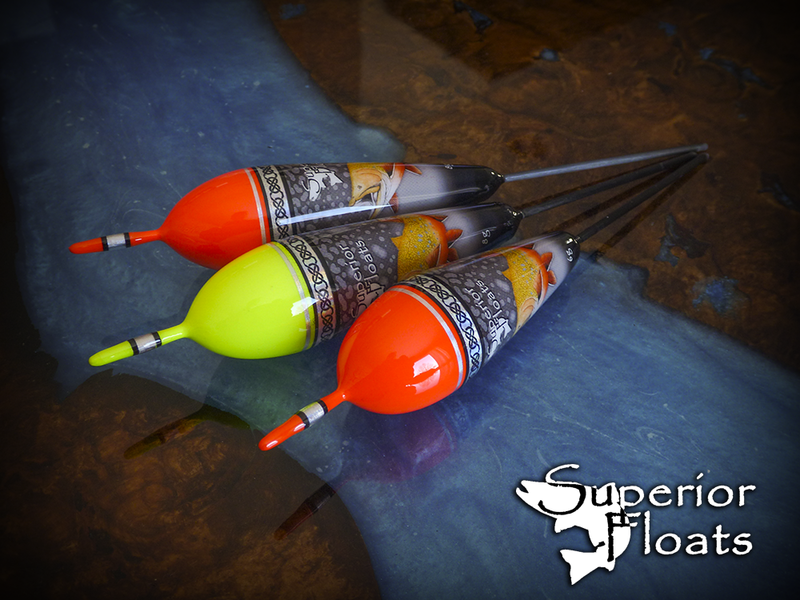 Superior Floats are custom fishing floats that are crafted one at a time from the finest quality balsa available. These floats require a tremendous amount of work and care to produce. Attention to detail is not spared. The finished product has a glass like finish that is tough and will protect the detail and look of these floats for years to come. One benefit to this tough glass like finish is added weight. Superior Floats are heavier than any floats you can buy off the shelf. This added weight will aid in casting distance, stability in rough water, and casting accuracy in windy conditions. The rating on each float is only a recommendation based on where the float will suspend while carrying the prescribed load. As a rule these floats will carry tad more than the rating suggests. Give Superior Floats a drift and I promise you won't be disappointed. Typical, but certainly not limited to, uses for these floats would be river angling for Steelhead, Salmon, Walleye, and Brook Trout. I have been using the slip floats while vertical jigging for Perch through the ice the past few winters. It has proven to be a very effective technique for filling the bucket with tasty treats.